Puri Jagannath has a penchant for the exotic. 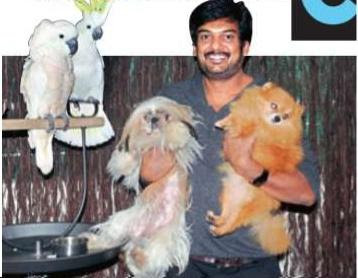 From extra vagant sets in his lavish movies to exotic pets in his office, he always goes all the way . The pets, tha cost anywhere between `25,000 and `5 lakh include around 50 varieties of birds, 13 dogs, ducks, fish and more. From the smallest monkey in the world -the marmoset -Mandarin ducks, parrots from Macau to the lion-like Chow Chow dog and colourful cockatoos, his office looks like a mini sanctuary rather than, you know, a director's office. “My fascination for pets began in my childhood. I started with 30-odd ducks and began to procure exotic pets as and when I could afford them. It is the best way to stay connected with nature and they are great stress busters,“ says the director, who loves spending time feeding and playing with his pets. He reportedly spends `2 to `3 lakh per month on their maintenance -imported food, breeding, training and medical care.